This guest post is by Conrad O'Connell of 91Digital, a digital marketing consultant with a focus on SEO, PPC, and email marketing. Conrad's epic post is designed to give owners and managers more options (than just listing sites) when vying for more pageviews. You know the routine: pay for a listing on one of the big sites and wait for inquiries to come in. In the world of listing sites, you’re one fish in a large pond of similar rentals. While standing out can be hard, you’re also against a set of rules and algorithms ranking your listing up against perhaps thousands of other homes, villas or condos. If you read VRMB, you know this. You also know that one of the last steps in ﻿VRMB﻿’s ﻿﻿Listing Site Independence Framework is focusing on the growth marketing strategies such as Pay Per Click and Pay Per View initiatives. Today, we’re going to dive into most of these paid media platforms and reveal you can use these channels to drive more traffic to your vacation rental website or listing page. After reading this post, you'll see that paid traffic can provide an excellent opportunity for you to book more rentals, build your branding, reach new guests (that haven’t heard of vacation rentals) and drive more website conversions. 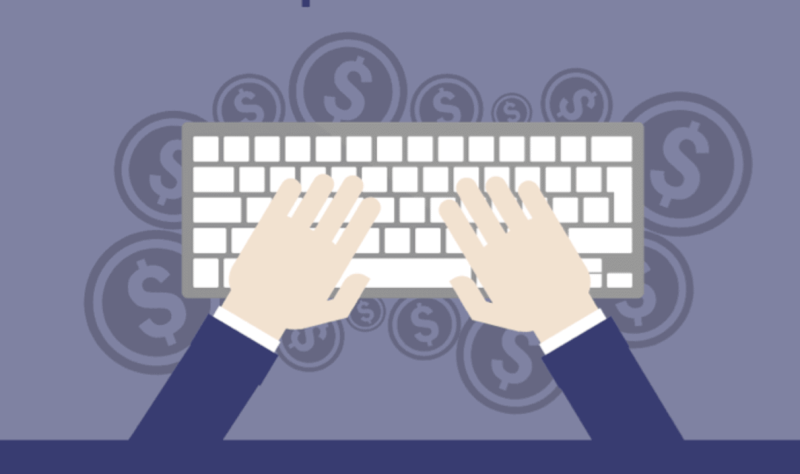 While paid traffic is not a sustainable investment, it can deliver immediate results. Before diving in too deep, it’s worth mentioning that this is a more advanced technique for generating traffic and bookings. It’s intended for rental owners and property management companies looking to supplement their current website traffic by targeting new potential guests with paid media. I am also assuming you're comfortable investing some money into paid advertising without the promise of an instant return. You may not create a slam dunk campaign right away when starting any new paid advertising channel. However, what I hope to accomplish is point you down the right path to seeing success quickly. Each paid platform has its own set of benefits and drawbacks, of course. Learning what those are can help direct you into testing the effectiveness of each platform for your rental business. It’s likely that a platform that’s all about discovery (Outbrain) is a poor target for the single-property owner in an remote destination that needs bookings right away. However, targeting Facebook ads (retargeting) with a special offer can work even if your website traffic is 1,000 or 1,000,000 visits per month. I will cover these tactics and a lot more below. Before sharing each platform’s important details (how to sign up, best campaign strategies and offers), I want to define common acronyms used with paid traffic so you can understand every single one. This is the amount you’ll pay for each click to your website. Many ad platforms ask you to set bids on a CPC basis. You’ll enter into the platform the most you’re willing to pay for a click to your website. Yes, I know you want to know what you should bid. However, each destination will have it’s own competition and other advertisers going after the same terms. I’ve seen markets in more rural destinations going for 50¢ and competitive areas go for $8.50 per click. Each tool often has an estimate bid amount that you can expect to pay: make sure to review this and bid according to what each visitor is worth to your rental business. This is defined as a measure of what each lead or conversion costs you on average. 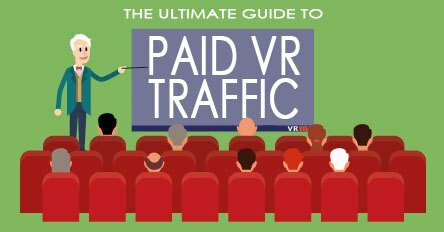 If you spend $100 on paid traffic and net 4 conversions, your CPA is $25 for each lead. Measuring conversions is critically important for the success of your paid advertising strategy. If you want, you can figure out your CPA on HomeAway or VRBO by adding up the number of leads you get and divide by the cost of your listing. This can provide a useful benchmark for CPA on the listing sites versus what you end up paying with various paid media platforms. Make sure that you are tagging every single paid traffic source with Google UTM tracking codes so you can see the impact of these visitors in your Google Analytics data. 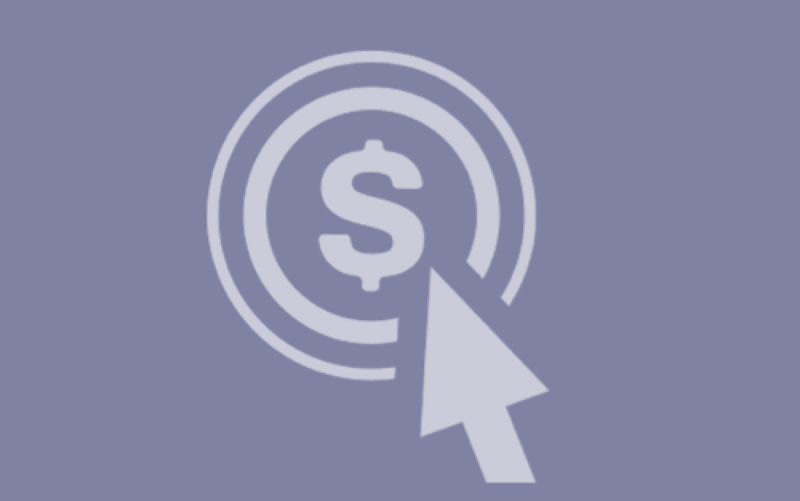 Simply put, PPC is the method that you pay for most online advertising: for each click to your website. While most ad platforms use PPC bidding, others charge for every 1,000 impressions you collect on your ads. 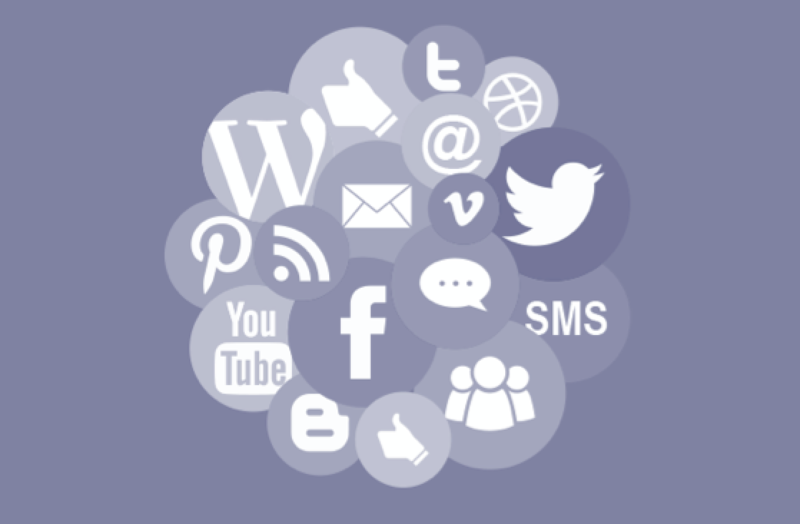 This means high-impressions ads that are more broad will often spend more on these platforms. Facebook, for example, gives you both options: paying for impressions or clicks. While it’s difficult to write one prescription for every ad, in general, smaller audiences sizes benefit from CPM bidding while larger audiences benefit from CPC bidding. This is the percentage of conversions that you net for every 100 visits. A website that has a 4% conversion rate means that 4 out of every 100 visits converts into a lead, booking or other tracked conversion in Google Analytics. You should generally (but not always) strive to increase this and evaluate paid media platforms on their ability to deliver a high conversion rate. Also known as ad scheduling, this is an important tactic to make sure you’re showing ads when you’re likely to generate conversions. For keyword text-driven ad platforms, you need to understand how broad match, phrase match and exact match keywords work. Going in-depth with this is an excellent support article from Google AdWords. By adding a snippet of tracking code to your website, you can “tag” visitors and serve ads only to those people who have been on your website. This is a more targeted form of ads than bidding on interest-based options. Not every platform offers this, but the ones that do are worth looking at more carefully. I’ve organized these ad platforms into three sections: gold standard, excellent and third-tier platforms. Speaking from personal experience, the gold standard platforms below are tried and true platforms that all send highly qualified traffic (if you target correctly) with intent to book. Put simply: I’ve spent hundreds of thousands of dollars with Google and Facebook over the past five years and have tracked their success time and again. Within a short period of time you'll be able to get up and running with Google or Facebook ads and start sending traffic to your vacation rental website right away. In my opinion they provide some of the best return and predictability as far as advertising traffic and results. Google AdWords allows you to target potential guests who are searching for vacation rentals in your destination using text based ads. Using the match types described above you can bid on certain keywords and then show up for these keywords when guests are searching for vacation rentals in your particular destination. Google AdWords allows you to target as many keywords as you would like. However, I recommend that you start small and make your campaigns larger as you see success. Google charges for each click to your website. Therefore, bidding on “bad” terms or keywords will end up costing you money and not driving you any bookings. Instead it's best to have small focused campaigns that target a very small number of keywords. I often recommend starting with just 5 to 10 different terms at first. Using either exact or phrase match you'll be quickly able to see how many searches each term is getting the number of clicks you're receiving and the cost for each click. If you’re new to Google AdWords, stay away from broad match terms as Google will end showing your ads more many unrelated terms. Common vacation rental search ad marketing strategies include bidding on “DESTINATION vacation rentals." Depending on where you're located this may have anywhere from a few hundred to tens of thousands of searches per month. Use Keyword Planner to check the search volume quickly. If you want to target long tail keywords, that's easy to do. I recommend setting up unique add groups for different long tail variations of your main keywords. For example, if your home has a private pool and many other rentals in your area do not, you may find there is a reasonable amount of search volume for people looking for vacation rentals with private pool. Remember: enter your destination name and keep your keywords to phrase and exact match. These terms will often have anywhere from 20 to 200 searches per month. Of course, this is much less competitive and you're also providing unique selling proposition about your rental property. When you take the effort to put long tail terms into a separate ad group, you will see a higher click through rate for these searches. Make sure your ad copy reflects the fact that the guest search for homes with private pools. Include that in the headline as well as the copy. Of course many other variations exist other than private pools. I often set up separate ad groups for pet friendly, luxury, cheap, search by bedroom, with hot tub, and many more. If there is a filtering option on your website search fields (if you have multiple rentals) it's probably the case the guests search in Google for the same amenities. For example, a separate group for oceanfront vacation rentals as opposed to second row vacation rentals will help you come up with more keyword ideas. 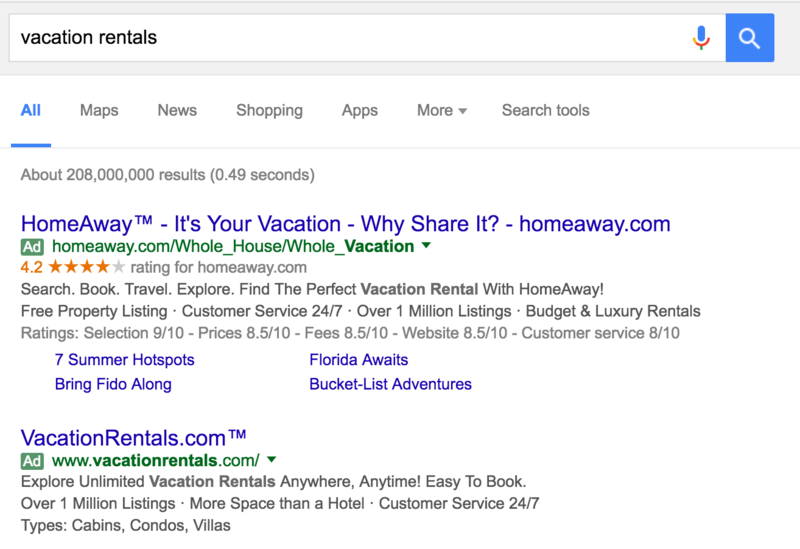 If Adwords intrigues you, feel free to explore my other posts like this one about﻿﻿ vacation rental PPC marketing strategies﻿. But for today, know that Google AdWords is an excellent platform for driving traffic to your website. Next up in our first-class ad platforms is Facebook Ads. Since the Instagram purchase, this also includes that platform as Facebook has made running on ads on Instagram a one-click affair. 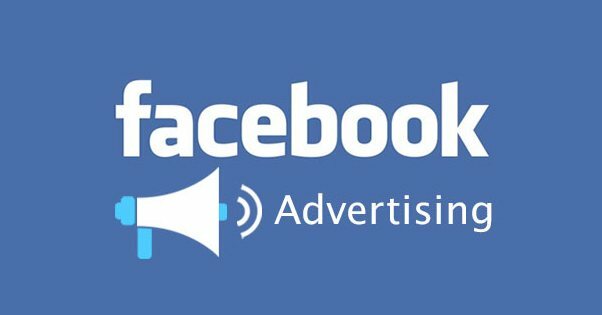 Facebook Ads allow for you to target ads based on users that fit certain demographics, locations, website behavior and buying habits. Covering every single Facebook ad targeting option may take an entire week, but it’s safe to say that Facebook has more aggregated data on users than any platform on the internet. Of course, we can use this to our advantage. Targeting potential guests on Facebook is actually fairly straightforward. If you're looking to get started at with a simple ad, you can upload your email list of past inquiries and encourage them to visit your website again. There is also other options for custom audience targeting: people who have visited your website, phone numbers and your email marketing lists. As you can imagine these are very effective targeting options because these people have already heard of your rental brand. Our goal, of course, is to encourage guests to click on our ads and leave Facebook.com to visit our website. In my opinion, designing an ad on Facebook is just as important as setting the targeting correctly. Compared to Google AdWords — there the effectiveness is more closely tied to targeting than ad copy. While Google, Facebook and Instagram may be the top-tier of online advertising, there are dozens of other ad platforms out there to use. These platforms may not net you the same type of reach as Google or Facebook will, but they can provide highly-targeting ads that can drive serious traffic. Not all of them are a fit for every single rental company, but with the right targeting, they can be winners. Compared to the reach of Google AdWords, Bing Ads offer far less impressions. However, the structure of the campaigns, ad groups and keywords is virtually identical. 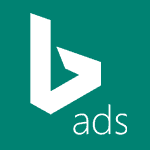 In fact, you can easily import Google AdWords campaigns into Bing Ads with just a few clicks. When setting daily budgets compared to your Google AdWords search campaigns, I often set the daily budget to be 20-35% of the total. For example, a $50 daily budget in Google will translate to around $15 daily budget in Bing Ads. If you decide to import your Google AdWords campaigns into Bing Ads, it is a “one-time” import. Any future changes you make to keywords, ad copy and other account updates won’t automatically be imported in Bing. Therefore, it may be worth first optimizing your Google AdWords before taking the time to run Bing Ads alongside. Then, any common mistakes or errors you find won’t need to be entered into two separate platforms. YouTube is actually the second-largest search engine in use. Luckily, we can target ads here too! 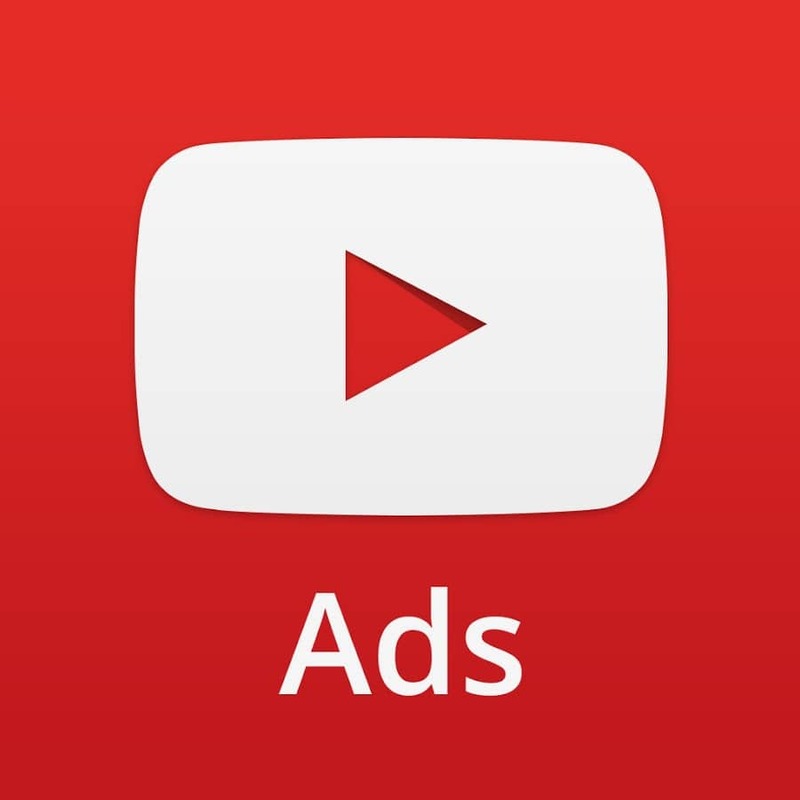 Using YouTube’s Ad platform allows for several different types of targeting. From aggressive pre-roll ads to more passive banners on the bottom of videos, you can target in different ways. Of course, the most effective YouTube Ads are those with high-resolution professional produced video. Creating the video often isn’t cheap, but the results can be amazing. Creating a video like Inner Circle member Kim Bergstrom did (below) for her Manzanita Beach vacation rentals is the perfect piece to use for retargeting on YouTube. While Twitter is one of the largest social media platforms out there, the ad platform isn’t nearly as advanced as Facebook. In the Twitter Ads platform there are options for retargeting, tweet engagement ads and follower ads, they are not as cost-effective as Facebook. Twitter’s demographic skews younger compared to other social platforms (other than Snapchat): this can be an advantage in the right destination. Advertising against a hashtag for a popular music festival in your area 20-45 days could be a great way to drive targeted traffic to a landing page for those dates. Pinterest has been covered before on this blog, and a newer ad platform has been launched to allow for promoted pins. It can be a good resource to vacation rental marketers because it's main demographic tends to overlap with our potential guest profiles: middle-aged women. Using this ad platform, you can show your vacation rental website to those who are researching your destination on Pinterest and encourage clicks to your website. All of the ad platforms below are “experimental” in my opinion. You can get some traffic out of these platforms, but I haven’t seen consistent returns on budgets to make them a surefire bet. 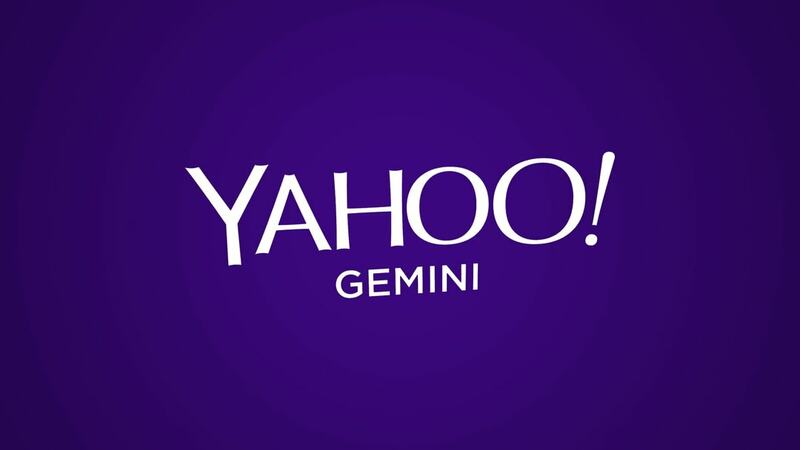 Yahoo syndicates ads from Google, but also offers up Gemini for their own search targeting. Just like Bing Ads, you can import your campaigns, ad groups and keywords from Google AdWords for a quick account setup. The interface is slick, but the reach on Yahoo is even lower than Bing’s ad platform. For destinations with lower search volume, it’s hard for me to commit to encouraging a vacation rental owner to spend time managing Yahoo ads for low reach. StumbleUpon was the poster-child of rapid fire article browsing before Facebook became the article sharing medium of choice. Users “stumble” links and then other users click through them in rapid succession. Users pick categories (you guessed it) and you can target your blog content up against similar areas and categories. If you have a broadly appealing content play, you can get a lot of traffic for a very low cost. For example, if you’re writing about “How To Plan The Perfect Beach Day” with videos, infographics and images. More specific topics probably won’t fare as well “How To Plan The Perfect Tybee Island Beach Day” as the audience here is looking for more general content pieces. Reddit is known as the “front-page” of the internet by its loyal users. You can purchase ads against a certain “subreddit” of your choosing. Depending on your destination, you could buy ads for your vacation rentals in the subreddit of a drive-to feeder market. For example, if you offered vacation rentals in upstate New York, you could target the New York City subreddit. With just over 100,000 subscribers, the reach can provide a fair amount of eyeballs for a low cost. If you’ve scrolled to the bottom of any major news or media website, you’ve probably seen Outbrain links. Simply put, you can buy inventory on major media websites like CNN or ESPN and get your website featured alongside other articles just under their content. It’s a powerful way to get lots of traffic to your site, but it does have some downsides. Experimenting with Outbrain reminds me of StumbleUpon traffic just a bit too: lots of views for a low cost. If you decide to test Outbrain traffic, remember that these guests aren’t in the mindset to book a vacation rental. Even if you have your targeting spot on, it’s possible that these potential guests aren’t even considering planning their vacation yet. Try very high-level general content that’s at the top of the guest vacation planning funnel to see broad reach and appeal. A more targeted solution than any other ad platform, BuySellAds.com is an interesting platform. Due to the fact that you can pick which websites specifically you show up on, you can be hyper-targeted with your ad content and increase your results because of this. While there are not many publishers on the site that cater to the vacation rental guest, there are general travel sites that cover specific travel verticals. For example, you could buy ads on RockClimbing.com to show to rock climbing enthusiasts who frequent your destination. Based on some research, Red River Gorge is one of the most popular climbing destinations in the US. Advertising on this site with a special offer for climbers could provide a great ROI with a targeted landing page. That is just one example, of course. You can also buy ads on other travel specific sites like Vagabondism, BucketListly and Adventure Seeker too. If you created the right type of content and offer for guests that are likely to be visiting those sites, you can open up a brand-new advertising channel for your vacation rental website that you competitors are very unlikely to copy. Of course, I would like to thank Matt for hosting another post of mine. Shout-out to Mission Sands Vacation Rentals, Red Sedona and LuxVacation﻿ for helping with research used in the above article. When used correctly, paid traffic can be a great counter-balance to long-term SEO strategies and it can generate immediate results: for instance, a last minute cancellation you need to re-book or a surprisingly dead upcoming low season. If you are looking to get started with Google AdWords, and would like a $100 promo code to get started, just email me conrad AT 91digital.net and I’ll hook you up with one. No strings attached. As a preferred partner, I am privy to a special stash. Other questions? I’ll be watching the comments below.